You can use the Emergency Recovery Utility to restore access to your protected files and folders in case you forget your password, or if you've enabled the stealth mode of Folder Guard. When you run the Emergency Recovery Utility, it prompts you to enter the Master Password of Folder Guard that you've set up, If you do not remember this password, click on the Forgot you password? link on the password window, and it will ask you to enter your license information. This step is necessary to prevent unauthorized users from using the Emergency Recovery Utility to disable the protection performed by Folder Guard and gain access to your protected files. Be sure to enter your license information EXACTLY as it appears in the message that you have received from us after you have purchased your license. 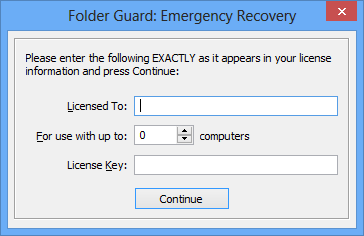 If you have entered your license information correctly (or if you use Folder Guard in the evaluation mode), the Emergency Recovery Utility will erase the Master Password of Folder Guard and unprotect your computer. After that you can run Folder Guard to set up a new Master Password and enable the protection back, if desired. Note that if you are using Folder Guard in the evaluation mode, anyone can download the Emergency Recovery Utility from this web page and use it to gain access to your protected files. To stop unauthorized users from using this utility, you need to purchase a license for continued use of Folder Guard and enter your license key into the program. After that, only you would be able to use the Emergency Recovery Utility on your computer, because it would not let other users to proceed unless they enter your license key into it first. When the download begins, you can choose to run it directly from our web site. Or, you may want to save the file on your hard drive first, into some temporary folder. Then, after the download is complete, run the file you have saved in the temporary folder, to begin the emergency recovery procedure.